This summer, we embraced another suburban cliché by becoming members of a private, extremely elite swim and tennis club. Okay, I don’t know how “extremely elite” it is, but the part of me that feels snobby saying I belong to any sort of club–particularly one that sounds like it may have its own chapter in The Official Preppy Handbook—forces me to be ironic. Crap, is being “ironic” also pretentious? Probably. Well, if you can’t win, join ’em. Okay, now without further ado, my list. 1. You’ve been having most of your meals at the Barracuda Café, or some other fishy, club-y establishment. 2. “Just go take a hot shower,” is becoming a catch phrase. 3. Every kid is suddenly blonde. 4. You’ve purchased 15 kinds of sunscreen and 12 pairs of goggles, but you can’t locate any of them. 5. If you did a shot every time you heard the words “A Finals” or “B Finals,” you’d be hammered. 6. You’ve redone the food pyramid in your head to include vast quantities of Gatorade and Twizzlers. You also believe a “Buddy Bag” is a really good multi-vitamin to go along with their “meal”, which is a hot dog. 7. You look at beach towels and think: Do I need to wash these? Do I even care? 8. 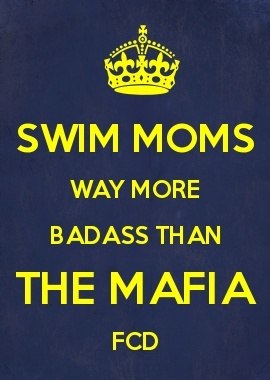 You’ve gone on YouTube to watch swim videos with your kids, and Pinterest to think of ideas for swim posters. 9. Your child freebases cereal every night at 8 o’clock. 10. Your child actually wants to go to swim practice. 11. Scratch #10: The coaches have upped their game, and you have to pull out your now well-honed “let’s talk about this later” speech, as you’ve learned discussing the next swim practice immediately after swim practice is like asking a woman if she wants to have another baby after she’s just endured hours of hard labor. 12. You’ve stopped putting the name Bob in quotes. It’s simply her name, dammit! Note to my brother Bob: Bob is not you. I also know my only blog reading brother is Bill. So, I’ll rephrase my note: Bill, Bob is not Bob. She’s another Bob. Now go back to drilling some teeth and taking care of your lovely newborn Rosie. I’ll come visit someday. You know, after this damn swim season is over. Additional public service announcement: If you actually implement #5, or have done a shot each time you read Bob in this entry, you are probably an alcoholic and need to seek help. Or you’re just really drunk. I was thinking about asking you if I can be your official guest blogger. First I need to finish delivering swimmer signs. Then I need to catch up on all of the laundry I neglected to do because I was busy making swimmer signs. Then I need to empty the dishwasher. Then I need to come up with something clever to write about. Maybe freebasing cereal will inspire me! Bob, we can totally work out some sort of guest blogging post! If you’ve gone through all the work of commenting–thank you!–you must somehow be established on WordPress. Meanwhile, if you are only delivering signs, as opposed to still making them, you are ahead of me. And regarding laundry: please note #7.